Six Catalan and two from other nodes of the EIT Health European consortium have been selected to participate in the CRAASH Barcelona acceleration program organized by Biocat in collaboration with CIMIT (Boston). CRAASH Barcelona is part of the EIT Health bootcamps program. A total of 35 projects submitted their application to participate in the program, aimed at cutting-edge technology projects (diagnosis, devices and e/digital health), arising from research centers, hospital research institutes and European universities. Of the 35 projects submitted, 70% came from the Spanish node and 30% from other EIT Health nodes, including proposals from InnoStars, Scandinavia, UK-Irland, Germany and France. Biel Smartgaze: Project from Catalan start-up Biel Glasses to develop electronic glasses that use computer vision and virtual reality to improve the sight of those with low vision, making them more self-sufficient. 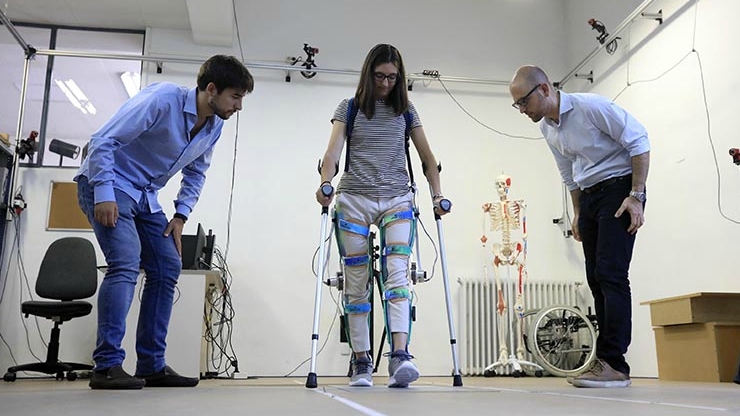 ABLE (Assistive Biorobotic Low-cost Exoskeleton): Project from the Biomechanical Engineering Lab at the Polytechnic University of Catalonia (UPC) with Institut Guttmann to develop a light, low-cost robotic exoskeleton to help patients with spinal injuries walk. Funny Friends: Project from Catalan company Vecmedical and Hospital Sant Joan de Déu to develop a respiratory rehabilitation system to allow children to play while doing exercise, obtaining data through online monitoring and improving adherence to treatment. DeepStroke: Project from Catalan start-up Methinks to make diagnosis and treatment of stroke patients faster and more precise with automatic analysis of neuroimaging using deep learning techniques. QuantEmTool: Project from the Portuguese start-up B2Quant that offers a software service to automatize analysis of medical images by quantifying relevant biomarkers for monitoring neurological diseases. ReMemory: Project promoted by the Consorci Sanitari de Terrassa to develop a cognitive training program for people with mild cognitive impairment, based on life-logging captured by a wearable camera. iBreve: Project from the eponymous Irish company to develop a wearable device to improve stress resilience by analyzing users’ breathing patterns with machine learning. Pancreatic elastase non-invasive test to diagnose pancreatic insufficiency: Project from the Institut Català d’Investigació Química (ICIQ) and Hospital Universitari Parc Taulí to improve quality of life for patients with pancreatic insufficiency, improving sensitivity and comfort of current diagnostic tools. During their time in Barcelona, at the beginning of the program, the CIMIT experts will give a conference open to the whole sector. Anyone interested must register beforehand. The second phase of CRAASH Barcelona will allow teams to validate their project in two other European markets, France and the Netherlands, through visits to the Medicen (Paris) and Yesdelft! (Delft) ecosystems in July and September. L'exosquelet robòtic ABLE de la UPC per ajudar a caminar pacients amb lesió medul·lar ha estat un dels projectes seleccionats per CRAASH Barcelona.